Physician, poet, and martyr; born at Palma, Majorca, about 1406; died at Palermo 1430. He was a relative of the Moses Rimos who was known by the name "El Pergaminero" = "the parchment manufacturer," and who, in 1391, was baptized in Palma, assuming the name "Raimund Bartholomeu." According to Zunz, Moses Rimos was also a grandson of the Moses Rimos who, as is authoritatively known, was at Rome in 1371, where he purchased manuscripts from the Ẓarfati family and others. It can not be accurately determined whether the grandfather or the grandson wrote the undated letter and laudatory poem sent to Benjamin ben Mordecai in Rome, in which the author, who was living at Terracina as a private tutor, with a salary of sixty ducats a year, at great length displayed his knowledge of philosophy and expressed his longing for home. 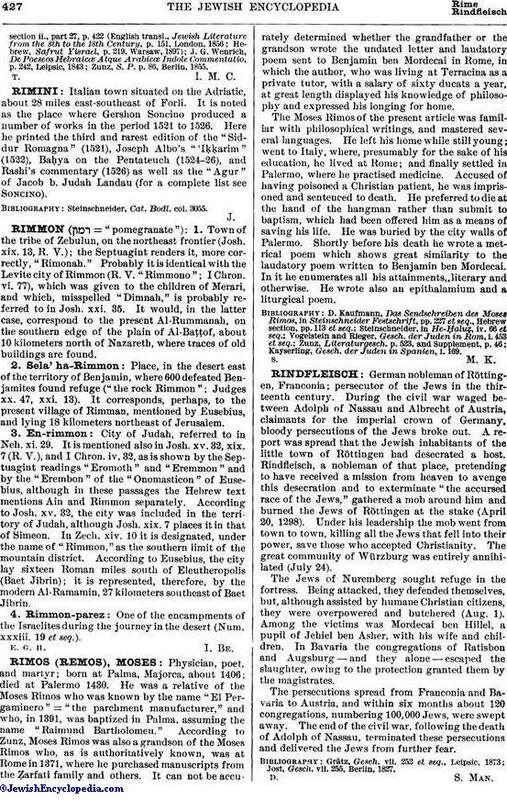 The Moses Rimos of the present article was familiar with philosophical writings, and mastered several languages. He left his home while still young; went to Italy, where, presumably for the sake of his education, he lived at Rome; and finally settled in Palermo, where he practised medicine. Accused of having poisoned a Christian patient, he was imprisoned and sentenced to death. He preferred to die at the hand of the hangman rather than submit to baptism, which had been offered him as a means of saving his life. He was buried by the city walls of Palermo. Shortly before his death he wrote a metrical poem which shows great similarity to the laudatory poem written to Benjamin ben Mordecai. In it he enumerates all his attainments, literary and otherwise. He wrote also an epithalamium and a liturgical poem. Kayserling, Gesch. der Juden in Spanien, i. 169.